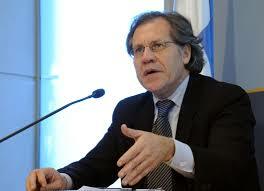 Left: Uruguayan Luis Almagro, secretary-general of the Organization of American States (OAS). There is a significant danger in this refusal to recognize the truth — if you do not correctly identify the enemy, it is difficult if not impossible, to combat him (or her) effectively. The target defines the weapon, and if the wrong target is used, the wrong weapons will be used as well. Islamic extremism is Islamic extremism, not radical extremism or workplace violence, and to effectively combat it, it must be correctly identified. None of the instruments of statecraft: diplomacy, propaganda, economic measures, subversion, military display or war, can be properly deployed and employed unless the target is correctly identified. In the current situation, therefore, it is particularly satisfying to find an important public official willing to call a spade a spade, and to hell with whatever the spades want to make out of it. President Trump made a fetish out of doing so during his presidential campaign, but now that he is president, he seems to be backing away. What a breath of fresh air! “to expect solutions from a dialogue that…isn’t a dialogue..makes us COMPLICIT….” (emphasis added). Indeed. And that is precisely what those who refuse to call Muslim extremism what it is and to combat it on that basis are—COMPLICIT in the horrendous acts of the terrorists and their organizations, such as Hamas, Hezbollah, al-Qaida and Islamic State. Think about that for a moment. “Political correctness” in the spoken and written word makes those who use it complicit in acts of bloody barbarism in the service of religiously-motivated totalitarians. This unacceptable situation makes it essential that those who favor calling spades “spades” demand that journalists, politicians, commentators, think-tanks, universities and others recognize and identify the truth, after appropriate confirmation. There must be an end to covering up for the terrorists, their organizations and their state sponsors, whether Iran, North Korea, Cuba, Russia, China or Venezuela. Hooray for Sr. Almagro!